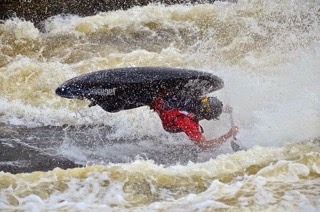 David Silk: Freestyles' Youngest Ripper By Alex DePue | DBP MAGAZINE ONLINE The World's Best Free Whitewater Publication. The first time I heard of David Silk, I was looking up how to videos to learn some play boating moves, and stumbled upon his how to lunar orbit video on YouTube. I quickly looked him up on Facebook as I had never heard of him before, and to my utter and complete shock he was only 16 years old! David is sponsored by Jackson kayaks, Shred Ready, Snapdragon, and Kokatat and is one of the best play boaters I have ever seen. He is already inventing his own tricks (which completely blows my mind), and is a driving force in competitions placing first for two years running at Junior Olympic East Championships, third in the 2014 Pan American Championships, 6th in Reno Riverfest Mens Freestyle and 5th place overall in 2013 Junior Nationals. Surrounded by a team of the best boaters in the world to learn from (not that he needs much help), David has no place to go but up. Looking into the future I can already see him capturing titles at basically every contest there is. DBP: David how did you get started boating? What was it about play boating that drew you in the most, and how did you learn so quickly? David: I first got started paddling when I was 12- my parents had done it a lot in the 90’s (in fact, it’s how they met), and had stopped around when I was born. But in June of 2010, they brought me on a sit on top trip down the Housatonic River in CT, and it was all gone from there. 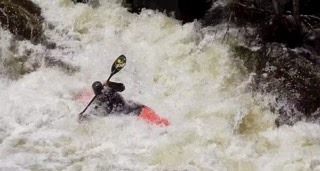 On my 12th birthday I got my first whitewater boat, and just have never really looked back. As for freestyle.. I always had fun surfing waves, and I just love the freedom that it gives me. There are always new ways to progress, new things to learn, and it’s just plain fun. I paddle all the time, and love pushing myself, so improvement happened fast. DBP: What is your favorite wave move? And favorite hole move? Are there any tricks (besides combos that you are inventing) that still give you trouble, or do you have them all locked in? David: My favorite wave move is, without a doubt, a nice big airscrew, and in a hole I’d have to say it’s the lunar orbit. As for tricks that I still find hard- I’m always trying to improve what tricks I already have, and make them even better. That said, the back phonics monkey (chronic monkey), still gives me a stupidly hard time, and I’ve only landed a few. DBP: Explain to us how a typical rodeo works in terms of scoring and how many rounds there are. There are certain new combos that are currently worth 0 points, do you think that as new combos get invented that they will be assigned point values? David: In your average rodeo, theres a certain amount of points for each trick based on how hard it is. So while a basic trick like a spin is 10 points, a really technical one like a tricky whu is worth 150. There’s also bonus points awarded on doing a trick huge, or clean (without a paddle), or for linking more than one trick together. You have 45 seconds to do as many tricks as you can, and each trick only scores once in each direction. As for the newer tricks- while there is a spot for tricks that aren’t defined yet on the scoresheet (the trophy moves), a lot of moves such as the Slim Chance (a back loop to downstream loop) that aren’t scored at all. I doubt there will ever be a spot for these, but it adds a really cool, non-competition side of freestyle that I really enjoy. DBP: Besides being a world class play boater, you are also an awesome creeker as well. What is the hardest drop you have ever run and why? Do you have your eyes set on any particular drops this season that you’d like to run? Do you plan on expanding into racing as well or will you stick to competing in play boating solely? David: The hardest drop I’ve ever run is probably Leap of Faith on Homestake Creek in Colorado. It’s a gnarly drop, in that there’s a pair of technical 6-8 footers right above that need to be lined up pretty perfectly to hit the right line, which is pretty burly in its own right. In the outflow of it theres a fairly large pin rock, so it’s just a matter of staying on your game the whole way through, as well as dealing with the 10,000 foot altitude. This spring I’d definitely like to do some more creeking around here in the Northeast the few months I’m home. Racing wise, I had planned to race the Steep Creek Championships at GoPro Mtn Games, but decided against it as I was dealing with a dislocated elbow.. not recommended. Hopefully I’ll get another chance to push into that this year! DBP: In the winter, playing in a hole can get really cold. Any tips or secrets to keeping warm? Is there a temperature where you draw the line and decide its too cold to boat? David: Layer, layer, layer. The trick is getting yourself as warm as you can, but making sure to not sacrifice a lot of flexibility. I recommend ski underwear. As for when its too cold… if the rivers entirely frozen over. DBP: You have an upcoming trip to Uganda with Stephen Wright. What are your plans for the trip? Will you be shooting footage to share with us? David: I should be leaving for Uganda on the 16th of February, and get back home around March 8th. I’m so beyond stoked for it! Stevo is one of my favorite guys to paddle with, and has been to the Nile for years running now. I should be getting way more footage than I could ever use, and getting some training in for team trials this year! I’m also planning to spend a few days volunteering at a clinic over there, which I’m stoked for as well. DBP: Looking forward, what are your plans for the future? 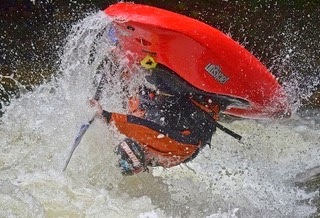 Will you become a pro kayaker? Where can we expect to see David Silk at the end of 2015? David: I’m looking ahead into a ridiculously busy year- Colorado circuit, Uganda, Canada, Southeast.. I should be getting in more travel than is in any way healthy. Hopefully I’ll be making the Jr US Freestyle team this year, and from there going hard for Jr World Champion… got some stout competition though! Hoping for a first place in freestyle in my hometown competition as well this year; for two years now EJ has beaten me out for it, but I’d love to pull out a gold. Just looking into a year full of competition, paddling, and way too much fun. I feel so lucky to be able to do it, and I’m so excited! Huge props to my parents, friends, and Jackson, Shred Ready, Snapdragon, and Kokatat for getting me to where I am, and can’t wait to see what’ll happen in 2015.